Built for the toughest of jobs, the RIDGID 36278 Portable TRISTAND Chain Vise securely clamps large pipes up to 12 inches. With its innovative design, the pipe vise has an optimized base layout to maximize the working area, giving you more space for working around the pipe. The large TRISTAND vise base overhangs the front legs for a clear tool swing. The pipe vise stand features a convenient lug to clamp the weld ground to the tab underneath, providing a good connection. Designed for easy portability and storage, it features integral legs and tray that fold in and secure in place with the chain. 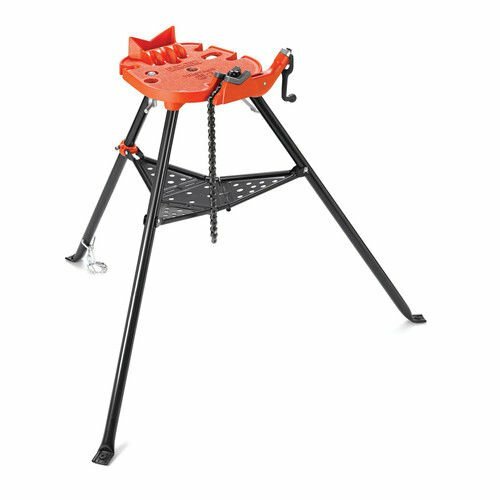 Offering strength and stability, the Model 460-12 pipe vise has a rugged leg chain and durable tool tray made for tough and demanding jobs. This RIDGID pipe vise has an 1/8-inch to 12-inch pipe capacity.